At start of formal negotiations, Likud Minister Levin promises to try and wrap up negotiations in one day, Liberman backs him. Following Wednesday’s meeting with Prime Minister Binyamin Netanyahu, Yisrael Beytenu chief Avigdor Liberman sat down for the first day of formal coalition negotiations. Senior officials in both the Likud and Yisrael Beytenu parties said that barring last minute surprises, Liberman’s entry into the coalition was all but assured. 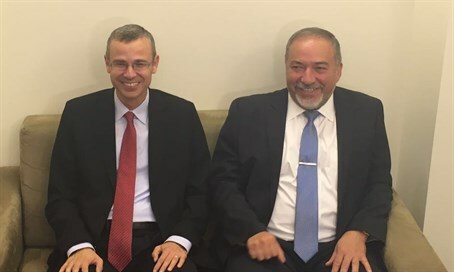 Liberman met with Tourism Minister Yariv Levin (Likud) for the talks, and before the negotiations began the two said a coalition agreement is likely to be wrapped up within the day. "In a spirit of cooperation, this morning we are renewing the talks after we held talks last night as well," said Levin before the meeting began. "Things are being managed well and we hope to conclude things as soon as possible." "This is a natural process that will strengthen the state of Israel, strengthen the coalition's stability and enable us truly to advance all the processes that the government and the public that elected us are interested in." In response to a question on timetables, Levin said, "we obligate to work as hard as possible so as to complete (the talks) this very day." Liberman for his part said he supports everything Levin said. According to reports on Wednesday, former Foreign Minister Liberman will receive the Defense Ministry, replacing Moshe Ya'alon. Yisrael Beytenu will also likely take the Immigration Ministry – an important position for the party, whose constituents are primarily immigrants from the former Soviet Union. Liberman has also sought to include pension reform in a coalition agreement, along with a plan to provide young couples with low-cost mortgages, and a bill imposing the death penalty for terrorist murderers. On more controversial subjects, like the Draft Law, Yisrael Beytenu is unlikely to be bound by the coalition’s existing agreements with haredi parties opposed to a restoration of the original version of the legislation. A report in Yisrael Hayom claimed that Yisrael Beytenu would be allowed to vote against the coalition on bills related to the draft. In other matters of religion and state, where Liberman finds himself at odds with Netanyahu’s haredi coalition partners United Torah Judaism and Shas, the Yisrael Beytenu leader has placed little to no emphasis, with no specific policy demands for the coalition. “Matters of religion and state, which would likely derail talks given the opposition of haredi [parties], are not central to Liberman’s demands from the coalition,” said the report.